Two of my favorite Christmas gifts are food and drink. 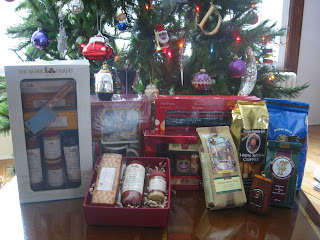 Pictured below is a sample of the edible goodies I got this year: coffee and Hickory Farms gift sets. Can you spot the two Christmas ornaments not hanging from the tree?